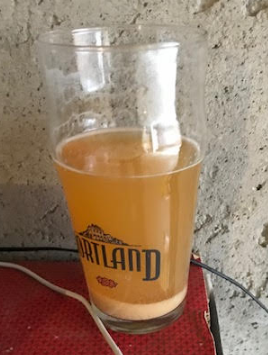 So I got a bottle of Galaxy Dry hopped Pseudo Sue that I sampled back in March and found a nice bunch of yeast that settled out in my glass so I decided to save it. This has been in a mason jar in my fridge since then. I plan to make another attempt at a clone recipe in the next two weeks and am curious if I should try to grow this up or if I should just use the WLP007 the recipe recommends? I assume I would need a stepped starter to grow this up before it would have enough cells to pitch. Any advice or recommendations? I have had varying results using yeast from a bottle but why not try building it up and smell/taste it to be sure it's OK? If anything doesn't seem right you can always go with the WLP007. That's a good point, hadn't thought about that as I've never attempted to harvest from a bottle before. I left about a half inch of beer in the glass above the yeast, swirled it up and poured it into a sanitized mason jar. Maybe I shouldn't even attempt it as it would have been exposed to possible contamination based on my drinking from the glass.